Springtime vygies and daisies are starting to peek their faces out of their deep winter sleep and to bask in the new warmth of our sun. There is a promise that winter will finally end and summer will return. This reminded me to check my scales and find, as I had expected, that there are a couple of extra kilos that I have put on during my wintery hibernation. Therefore I decided to start eating more healthily which means lots of salads and less starch. To make the salads interesting and appetising I like to try out different sauces and ingredients. With my cheeses, especially the Blues, I can create some wonderfully flavoured dressings. In this week’s recipe I made a creamy salad dressing by combining buttermilk, olive oil, vinegar and the unpasteurised Fourme d’Ambert. This raw milk, blue cheese which has been made around the town of Ambert for thousands of years, has a subtle but distinctive flavour, neither acid nor overpowering. This salad can be served as a light meal or starter or can be accompanied by grilled, free range chicken breasts for a more substantial meal. I recommend pairing this salad with a subtle white wine such as a Chablis from William Fevre. 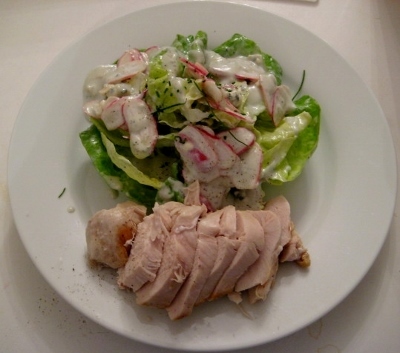 If you are serving chicken breasts with the salad, start by sauteing chicken breasts in olive oil for about 15 to 20 minutes until they are cooked through. (They should be opaque all the way through when cut into). Wash salad leaves, radishes and chives and dry thoroughly. Place salad leaves in a bowl. Mix radishes into the salad leaves. Chop chives into short lenths and decorate over the top of the salad. 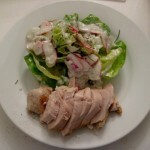 Slice warm (or cold) chicken breasts and serve on a plate with the salad. Serve with a glass of delicate Chablis from William Fevre.